Blanda was chosen by the Chicago Bears in the 12th round of the 1949 NFL draft and, with a very brief hiatus in Baltimore, played for them for ten years. He led the league in passing attempts (362) and completions (169) in 1953, but otherwise was forced to share the quarterback job while handling the placekicking. After two seasons (1957 & ’58) in which he saw scant action at quarterback, he retired. The creation of the new AFL in 1960 pulled Blanda out of retirement, and he led the Oilers to the first league title while throwing for 2413 yards and 24 touchdowns. Oilers went 10-3-1 to win the AFL Eastern Division. After starting off slowly at 1-3-1 (during which time Blanda was briefly benched in favor of backup Jacky Lee), Head Coach Lou Rymkus was replaced by Wally Lemm and the team won nine straight to close out the regular season. Set records for points scored (513) and touchdowns (66). Defeated San Diego Chargers for AFL Championship (10-3). Blanda was an AFL All-Star after each of the next two seasons and led the Oilers back to the AFL Championship game in ’62 despite being intercepted a record 42 times. He led the league in interceptions thrown for four straight years (1962-65), but also in passing yards in 1963 (3003) and both passes and completions from 1963-65. 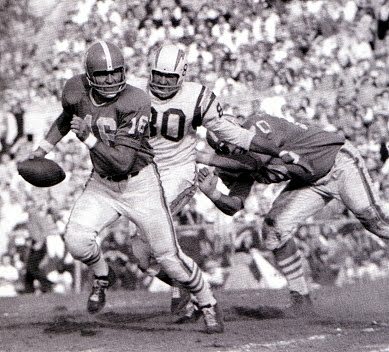 The team’s record had tailed off badly after ’62, however, and young QB Don Trull was drafted to be Blanda’s replacement. At age 39, Blanda was let go by Houston following the 1966 season and signed with the Oakland Raiders. He proved to be a capable backup quarterback – especially in a remarkable 1970 season when he again received MVP consideration – and placekicker for the Raiders through 1975, at age 48. Blanda retired as the all-time NFL leader in scoring (2002 points) and field goals (335), as well as seasons played (26 – the one that still stands), and was inducted into the Pro Football Hall of Fame, Class of 1981.